Our life can be busy, particularly during the week. I plan and prep meals and try to make them pretty healthy. We also get up extremely early (4:30 a.m. most days) so I try to make breakfast and quick and efficient as possible. A huge part of that is keeping the fridge and freezer organized, which helps with all meals of course, not just breakfast. 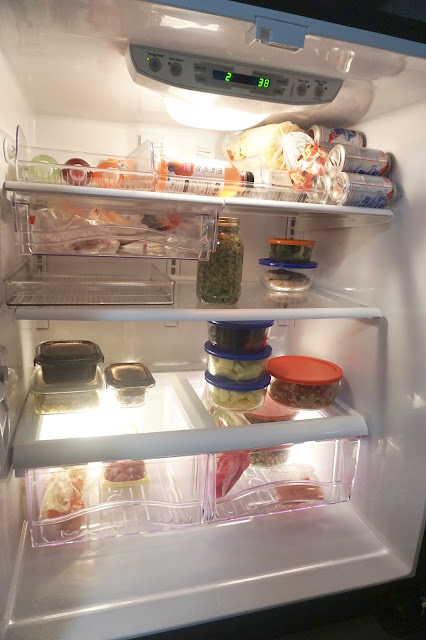 So I thought I would give you a little tour of how I organize my fridge and offer some quick tips on how to keep your space organized and running efficiently when life is busy. I hope they help you stop wasting food because it's gone bad sitting in your fridge, one of my biggest pet peeves. 1. I took the photos after our typical Sunday shopping trip yesterday, after I prepped lunches, so you could see what our version of a stocked fridge looks like in our house. We enjoy shopping weekly rather than stockpiling, so we don't keep a ton of things on hand, which is my first tip for you - don't stockpile too far in advance! Especially if you're not used to meal prepping, because you're going to forget about things and they'll go bad, and I hate wasting food and money like that. If you have open space, you'll see things more easily and be able to keep them looking neat. 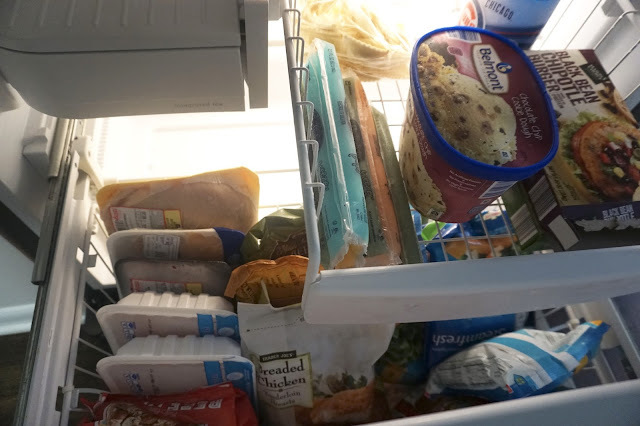 It seems empty on Sundays because the meat we use throughout the week for John is currently in the freezer (pictured below) and I defrost it on that tray in the middle shelf to the left. As I cook, I put leftovers into glass containers and that begins to fill the fridge up. I plan ahead when things have similar ingredients and make the full week's worth at once. For example, if two dishes use rice, I make all the necessary rice on Monday and then put the extra in the fridge for the next meal. I don't need to cook it twice! This is why Sunday evening the fridge is the cleanest it is all week. P.S., the mason jar is homemade dog food. 2. Be realistic about how much you can get done in a busy week. Always check your schedule before committing to a meal plan, so you don't waste any food. There's only so much time in a week and if you have spin class after work on Wednesdays, it's going to be really hard to come home and make a 4 course meal from scratch. There's no reason why you have to make a complicated meal every night! For those times, I get meals from Snap Kitchen. Snap Kitchen creates healthy, handmade meals that you take and heat. They're made fresh every day and they have the nutritional info right on the label and they're color coded by meal, so I can easily find the vegetarian options for myself. There's also options for Paleo, Whole30, whatever your preference is. I like having this option so I don't feel pressured to make complicated and still healthy meals every night. 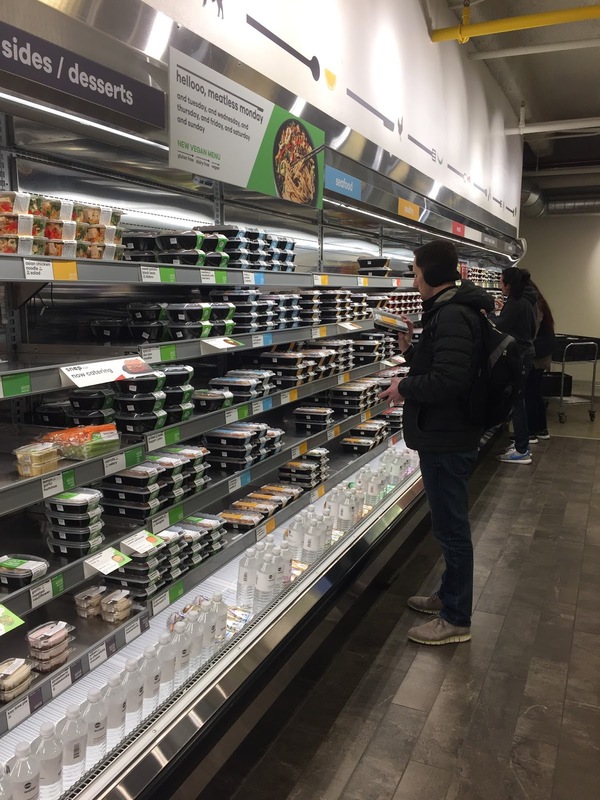 It's also saved me when I've prepped lunch and then completely forgotten it at home, because there's a Snap Kitchen right by my office. Another fantastic thing, fellow Chicago residents? 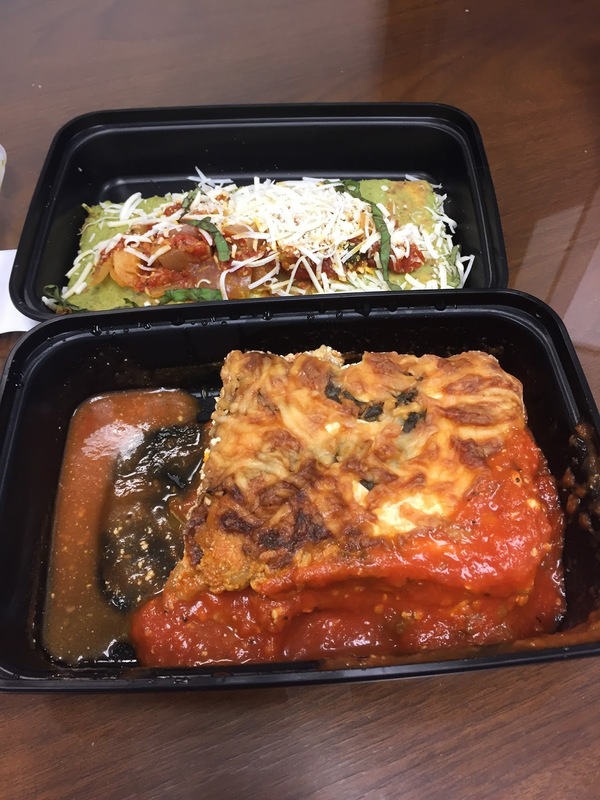 Snap Kitchen delivers. You can get everything straight to your door on Sundays and be set for the week! Download the app here. 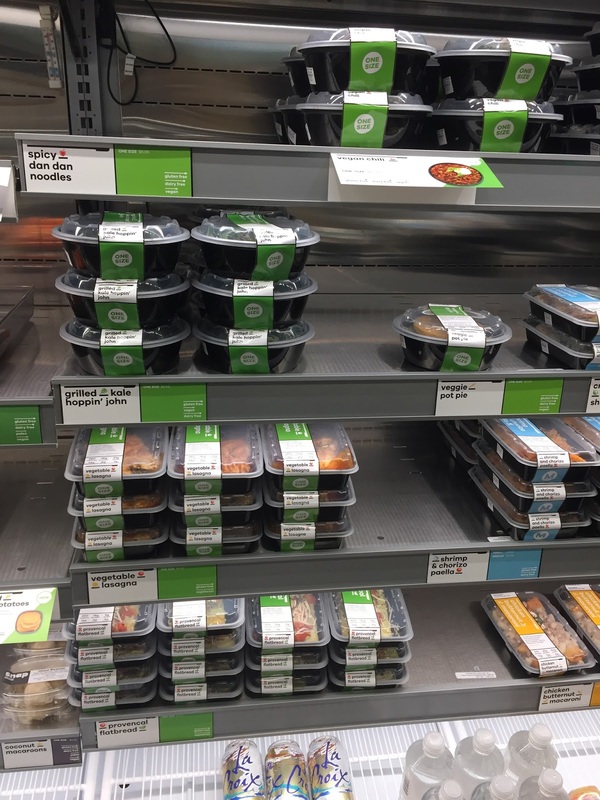 Snap Kitchen is available in a few cities, so search by zip code to find your nearest location. 3. Organize shelves and areas of shelves by meal. This helps so much in the mornings, it's ridiculous. I'm barely awake when I start making John's breakfast - I usually let the dog out and go straight to the fridge, no coffee yet. Having all the breakfast items in one spot make it so much easier on me. I just pull everything out from that one spot and go, it's like autopilot. I do the same for lunches, with John's in one spot and mine in another. The final area is reserved for dinner prep ingredients on one side and leftovers on the other. 4. Keep the freezer looking nice too. I think it gets overlooked more so than the fridge. But we keep ours stacked like this, sort of like the KonMari method! We can see everything at once. Meat is together to the left, then some frozen prepared meals that John likes, and then frozen fruits and veggies. In the drawer we keep popsicles and ice cream, and my veggie burgers. 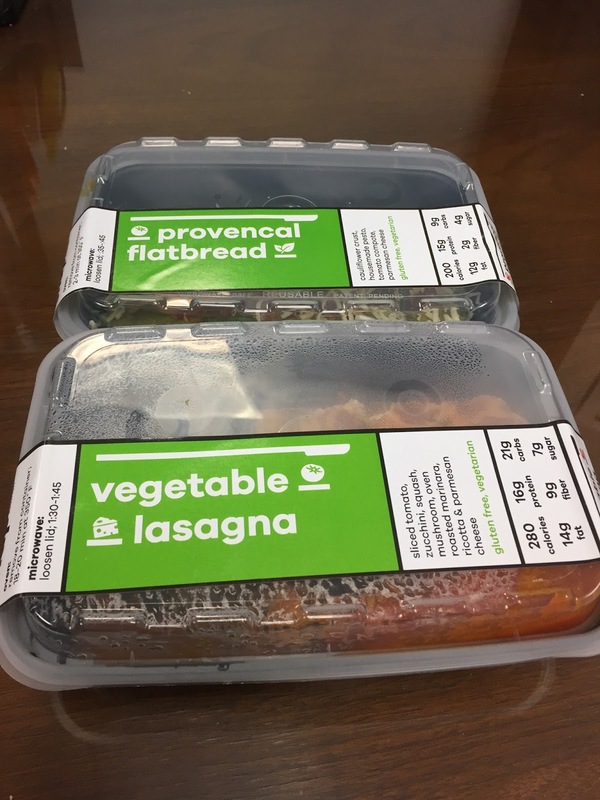 If you're lucky enough to be in an area that has one, visit your local Snap Kitchen and pick up your first meal today! Which one would you try first? 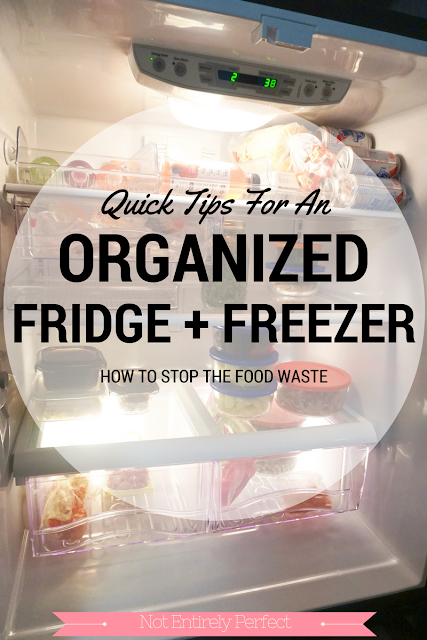 How do you organize your fridge and freezer?